Recently I was working with a coaching client, and I asked him to describe the kind of work he’d like to be doing in twelve months time. Very quickly he fell into the trap of thinking about the kind of ‘job’ he ‘could move into’, rather than the kinds of activities that felt energising and meaningful. He got stuck and said, ‘I can’t really describe it. What I’m thinking doesn’t exist.’ When I consciously pulled him back from naming a job title, to exploring ways of working, he quickly listed all the types of activities and qualities of those activities that he was drawn to. This did three things: 1. He gave himself permission to think outside of a known, defined job title; 2. He consciously thought about what he would like to do, rather than what he had always done; 3. It opened up a discussion about what he felt he deserved and what he could create. We disrupted his existing thoughts by imagining what could be. It was an invitation to innovate his working life. The ability to see new opportunities where others don’t, create new positions/jobs that never existed, while undergoing continuous learning and adapting to economic change… [it] is about critical thinking, problem-solving and aligning your interests with the current and future market needs. 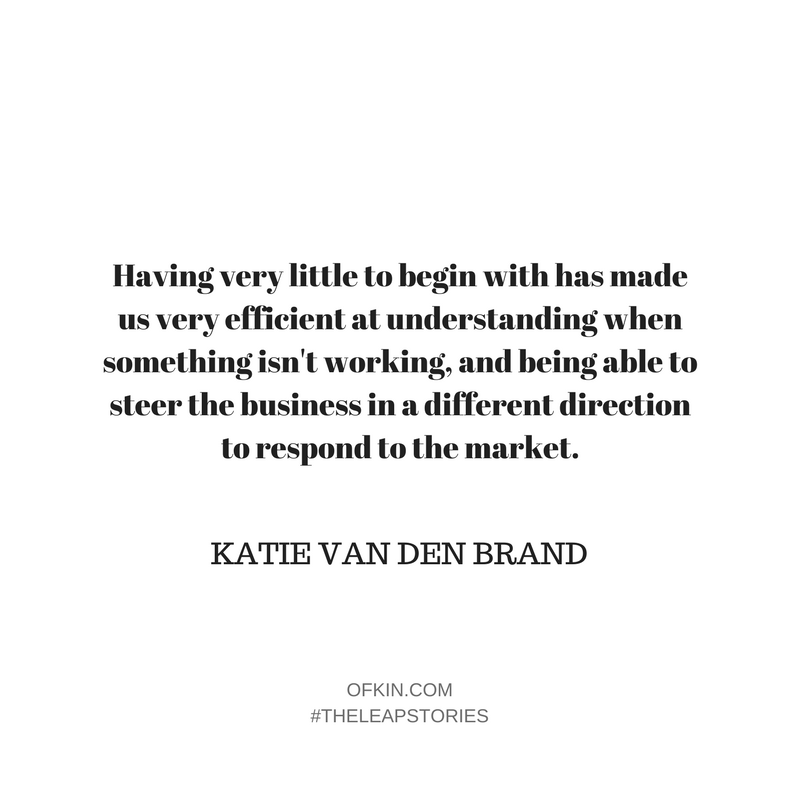 Leap takers like this week’s interviewee Katie van den Brand, innovation lead at Maker + Co, live and breathe innovation and the vulnerability that is necessary for change. Having worked her way into a job that she knew she could do easily, she started to think about what would feed her creatively, and give her the type of ideal flexibility she as a single working mum needed. That led to a chat during a playdate which turned into a career leap away from the ‘job’ towards the kind of work she wanted to be doing. Katie repurposed her big business knowledge and skills, and partnered with others to support regional innovators in Western Australia. Today she’s one of the team at Maker + Co, a social enterprise providing social and economic development opportunities to traditionally been marginalised community sectors. Their aim is to maximise improvements in human and environmental well-being, through co-working, innovation and creativity. Maker + Co currently provide co-working and/or incubation and mentoring to approximately 20 local businesses including five Aboriginal businesses. As Thomas Friedman said ‘Need a job? Invent It.’ In an age where the future of work is rapidly changing, personal innovation in our lives is necessary for a career that won’t simply be shaped by jobs ‘out there’. The opportunity lies in innovating in our own version of work and connecting dots in a new way. So, what kind of work would you like to do? What job title would you like to invent for yourself? When I was a young woman, I wanted to be the first female Prime Minister of Australia. From a very young age, I had a desire to become a professional photographer. I studied a Bachelor of Science in Psychology, because I was too afraid to complete an ‘Arts degree’ (no one gets paid to be a photographer!) and I did not like maths, so I thought I could avoid it by studying humanities… I obviously didn’t read the course information well, as I got stuck with three years of statistics! Deciding to go into business as a single mother of two toddlers, in a field that I have zero qualifications or experience or networks in (straight off the back of maternity leave). I was a stay at home mum of two gorgeous kids, who were two and a half and four at the time. My most recent career was working for BHP Billiton in Safety and Finance, which was a pretty smart move for security, but really unimpressive in feeding my creative drive. My sister Lindy, a fearless business owner, and mother of two (nearly three) who has zero time for fear-based discussion and has been instrumental in me expecting more from myself personally and professionally. The previous owner of my current business, Jordan, whose attitude to life was innovative, rule-breaking and disruptive. It helped me to really question the constructs that I had built around expected ways for people to behave (especially women in business) and helped me get out of my own way and take some leaps of faith. Since starting in my current field, I have had the pleasure of meeting and working with an increasing amount of like-minded and inspirational people on a regular basis. Which is how I know I have made a great decision. I really had nothing in place. It happened over a play date at my house, where my now co-director was having a cuppa and we were both interested in seeing Maker + Co continue and develop in the region, so we decided to go into it together. The only thing I considered was that it would give me the flexibility to be with my kids as much as possible (hence going into business with others) and there was very limited financial risk to begin the venture which was a key consideration given my circumstances. What was your defining ‘I can’t do this anymore’ moment that led you to the leap? I was really keen to get back into some type of work, but not full-time, and I was determined not to go back to an unsatisfying career that was an ‘easy’ way to make money. You have to believe that money isn’t the determining factor, because you will be broke, maybe for three months, possibly three years (depending on how great your business plan and if there is a market for it). 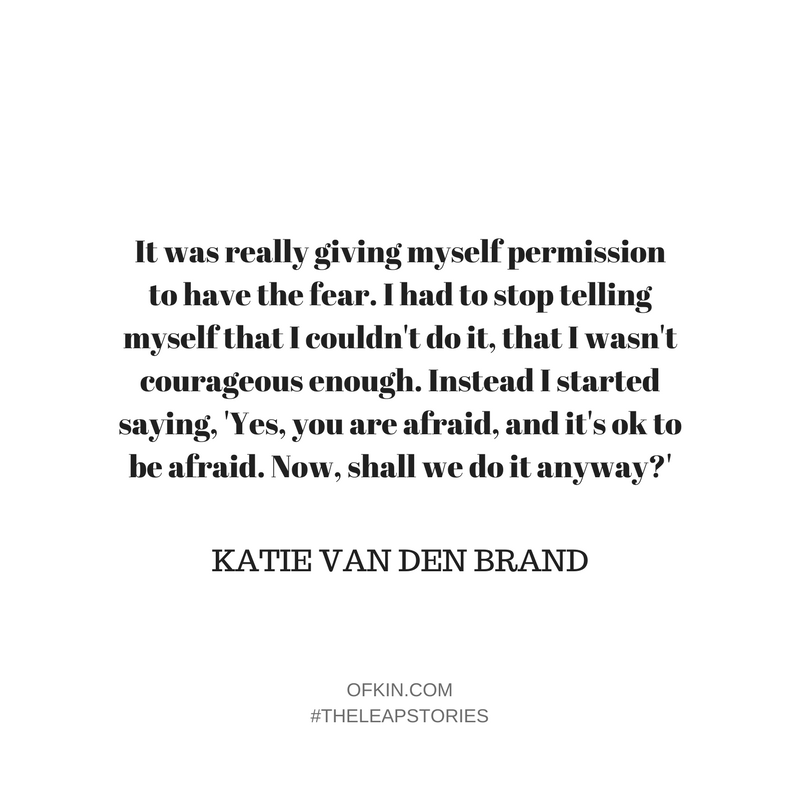 For me, it was really giving myself permission to have the fear. I had to stop telling myself that I couldn’t do it, that I wasn’t courageous enough. Instead I started saying, ‘Yes, you are afraid, and it’s ok to be afraid. Now, shall we do it anyway?’ And it changed the way I thought about fear. I still felt scared. I am still scared about lots of things, but now I say that’s ok fear, you can come and hang out here, you are just another feeling, thanks for coming. Now, onto more interesting things. This was a massive lesson from the fabulous Liz Gilbert and in particular her book Big Magic. The way she spoke about fear and creativity (everyone is a creative) really resonated with me. If you can find someone you resonate with, it makes the lessons really stick. After reading Brené Brown after my separation, and then Liz Gilbert’s wonderful book, I changed my thinking and started embracing the idea that you just need 30 seconds of insane courage, then something will happen. It might be good, it might be crap, but it will be something. You will have moved past the fear that got you stuck in not wanting anything to happen. Once you practise this move in a few situations, it becomes easier, and you stop attributing success or failure to the outcomes. It has totally changed my way of existing in the world. Professionally and personally. On the smell of an oily rag. Like all good startups, we had no money, so we had to work really really hard, long hours the first year just to make rent. It was an eye-opener and, in hindsight, I wasn’t prepared for the hours of ‘learning’ I would need to do just to work out how to make money in the business. Having very little to begin with has made us very efficient at understanding when something isn’t working, and being able to steer the business in a different direction to respond to the market. It’s been a challenging first year, but the business lessons I have learnt are invaluable. My marriage broke down when my children were very young, and it was a massive leap to walk away from something I thought was going to last a lifetime and into the unknown of raising children alone. I had a lot of fear and confusion after the breakup, and it was one of the most difficult times of my life. I think after I became a single mother, there wasn’t much else that could scare me anymore. It was just a shame that I needed to go through that heartbreak to gain that life lesson. 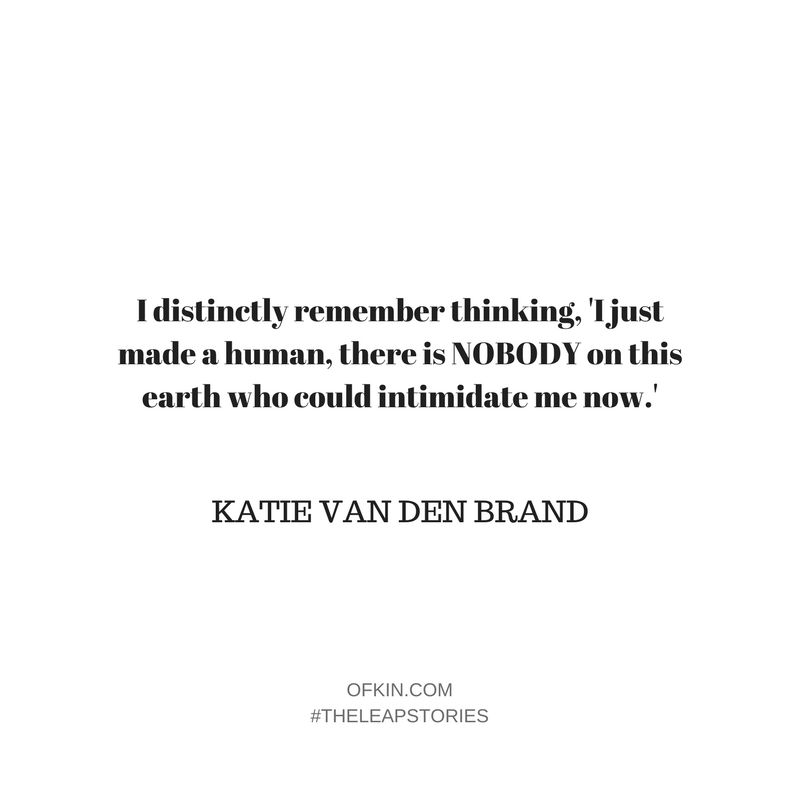 I am very early in my ‘leaping’ journey, and I look forward to taking many more leaps in the next chapter of my life. 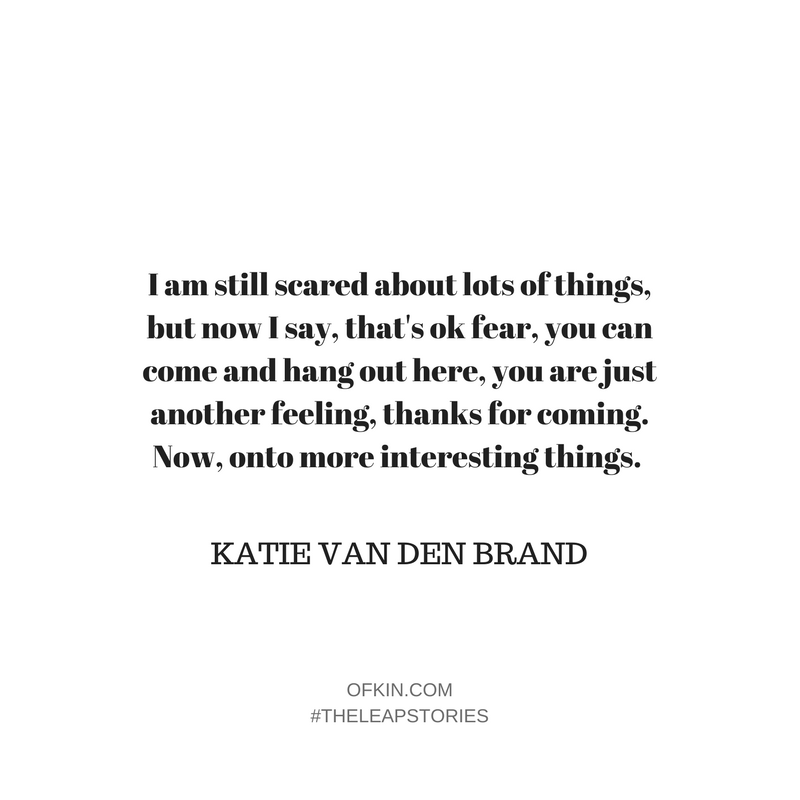 It’s important to put into perspective the ‘real’ risk associated with taking a leap, usually, there are a lot of wild fears we have spent too much time thinking about, but could be just excuses. Honestly, I am most fearful of never finding true love. How I deal with it? Well, I try and focus on knowing and understanding the type of person I am, and what a wonderful relationship would look and feel like. Then I hope like hell I can manifest them into my life somehow (insert evil laugh…). How would you rate your level of happiness about making your leap? 1 being sad, 10 being rad. Definitely a 10, without a doubt the best decision. I have honestly enjoyed the last year of my work so much. There has not been a paycheck yet, but things are starting to turn around for us. 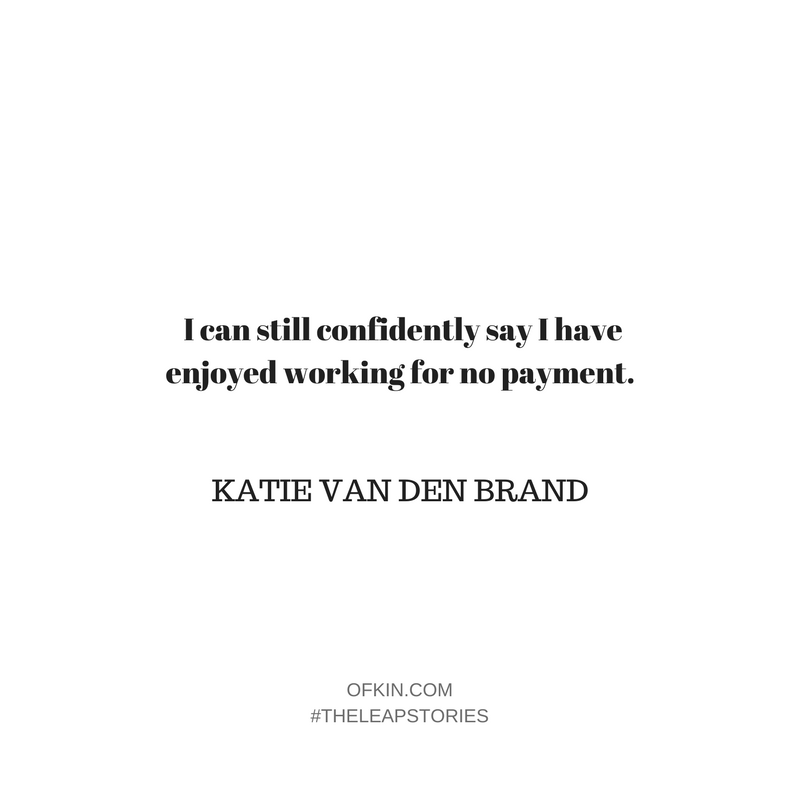 I can still confidently say I have enjoyed working for no payment. Autonomy. I created my position. Nothing exists like this in my region. I learn what I need to know, I create the type of work I want to do and the networks I want to be a part of and that is starting to payoff. Being completely responsible for bringing in the paycheck. It is always a temptation to go the ‘easy route’ and go into a job similar to what I have done previously, but when I sit down and think about how it could work with the kids, there is nothing available that would give me the flexibility to be around my kids as much as possible before they start full-time school. I look at my values, and how my work is aligning to my values, and it helps me to get over that pretty quickly. My next leap will be a geographical leap. I have always wanted to travel Australia in a camper with my kids for a year, or live in Copenhagen for a year, so I feel the itch for that, and I will be working towards an opportunity to make that happen in the next five years. If you don’t make time to work on creating the life you want, you’re eventually going to be forced to spend a lot of time dealing with a life you don’t want – Kevin Ngo. It’s the ordinary, everyday people. 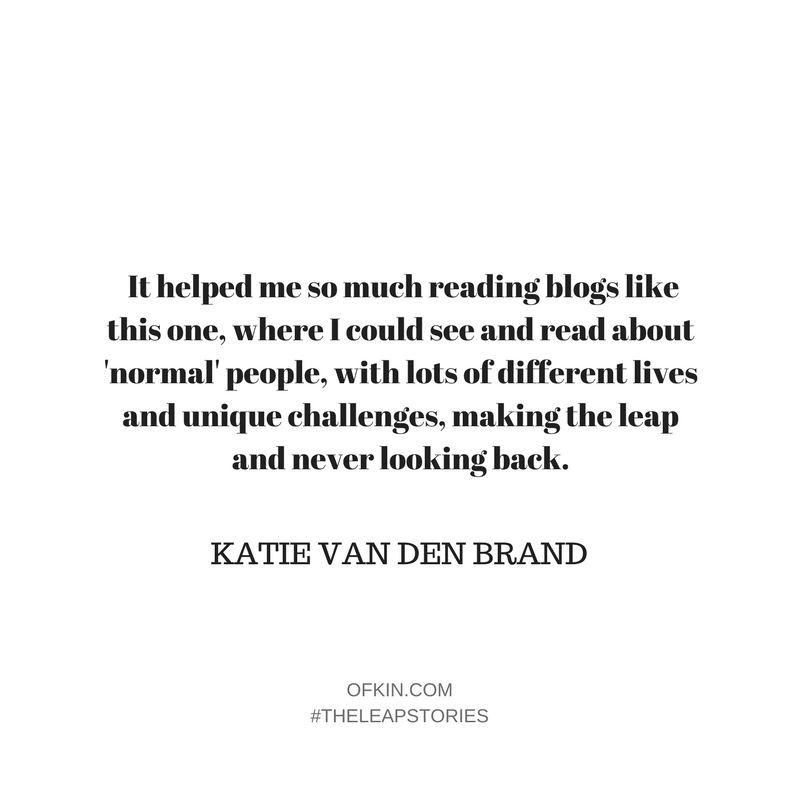 It helped me so much reading blogs like this one, where I could see and read about ‘normal’ people, with lots of different lives and unique challenges, making the leap and never looking back. Find yourself some cheerleaders (or just one) and hang out with them a lot, and talk to other people who seem fearless and glean as much inspiration from them as possible (I find this works well if you can hang out with people that are mid 20s starting their own businesses and breaking rules about work expectations). 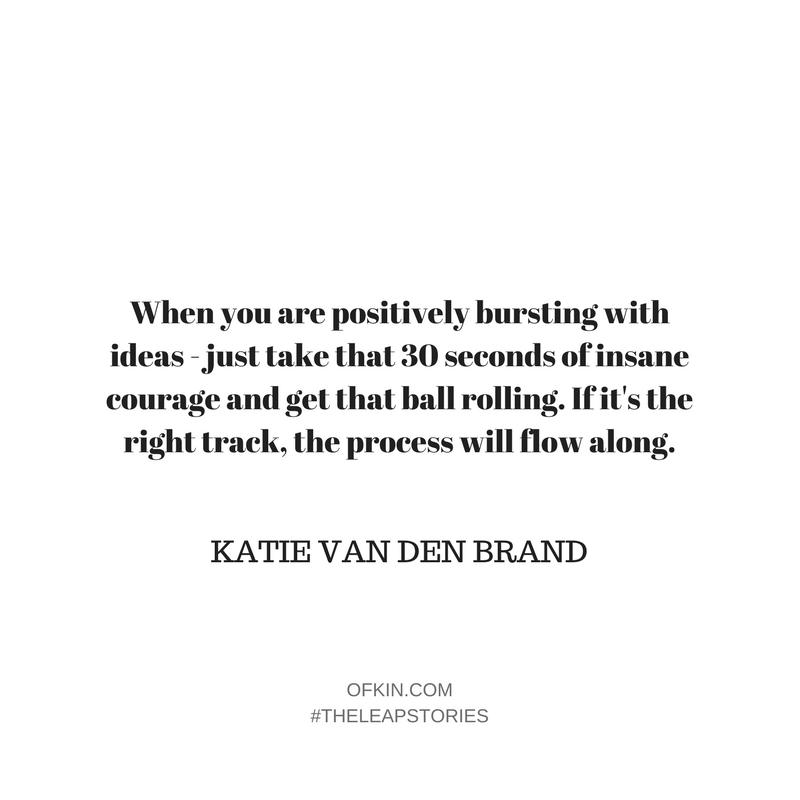 Then, when you are positively bursting with ideas – just take that 30 seconds of insane courage and get that ball rolling. If it’s the right track, the process will flow along. What question did I miss about your leap? And what’s your answer? How many hours do I work, now that I work for myself? Well, about 40-60 hours per week (two full days at the office, and nights when the kids are in bed, plus some random days where I need to attend meetings and the kids go to a friends house for a playdate). If you could take the role of Innovation Director for your life, what would you disrupt?